On Anima Mysterium, the first album from South African rapper Yugen Blakrok since her international high-profile feature on last year's Black Panther soundtrack, magic of the heaviest variety abounds. On Anima Mysterium, the first album from South African rapper Yugen Blakrok since her international high-profile feature on last year's Black Panther soundtrack (she held her own alongside Vince Staples and Kendrick Lamar on car chase track "Opps"), magic of the heaviest variety abounds. Blakrok invokes ancient and supernatural figures from around the world - Anubis, Diana, banshees - and her own sheer talent places her front and center in this mystical pantheon. From start to end, a cosmic feeling permeates the recording, gothic vibes dominating an unstoppable flow. While there is not a weak track in the bunch, there are some particularly representative standouts. Single "Picture Box" sees Blakrok at her grandest, making a majestic descent to "the gallows / Where my shadow reigns supreme / Beautifully hideous, I'm a savage and a beast." Throughout the album, Blakrok embraces these dualities, setting the scene on opening track "Gorgon Madonna": "Applied contradictions / Angels interbreed with demons / See, misery loves company, it overwhelms and feeds me / Fills me as I embrace the light and dark completely." She is "ambidextrous androgen", "both the empress and the king", and can "spit fire and water" in equal measure. On a larger scale, this dichotomous nature plays out in the ways that Blakrok mixes the immediate with the galactic. While "Gorgon Madonna" and "Picture Box" establish Yugen Blakrok, she also looks outward into otherworldly realms on "Morbid Abakus", where "star patterns split beams, expose flaws in our time". Often, her lyrics are similarly arcane, for better or for worse, and even at their most perplexing, Blakrok delivers them with such bare confidence that she sounds like the master of the universe she describes, a reality filled with gods, goddesses, and celestial oddities. Musically, Blakrok keeps her tracks minimal, simple loops in dark shades of black and gray. Beats and basslines stay buried deep beneath her and her featured collaborators, a foundation for their words that never takes the foreground. Anima Mysterium is about the mind of Yugen Blakrok, and everything else exists to set the stage for her reality-bending words. Not that the backing tracks are thoughtless or unnecessary. On the contrary, they are crucial to Anima Mysterium's ominous atmosphere, and a few tracks have memorable moments. "Monatomic Mushroom" uses keys and low strings to particular effect, making it perhaps the most melodically appealing cut on the album. Otherwise, while the music is necessary, it does at times feel replaceable within limits, as if another dystopian loop could take its place without disturbing the album - or, in some cases, without being very easy to notice at all. That's hardly the point, though. 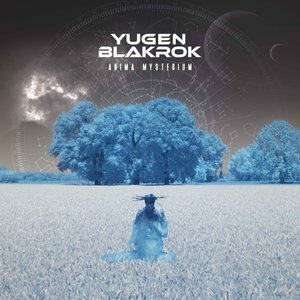 Yugen Blakrok's flow, the depth and power of her unshakable voice, the realms that live inside her - that complete package is the point of Anima Mysterium. Yugen Blakrok is an artist who molds word and sound in a way that feels like elemental magic. She is a performer, of course, but she is also a creator, and Anima Mysterium's offbeat subject matter shows that her works are ones to be reckoned with, and even when the songs are rough in form, Blakrok is mighty in impact, and no one else right now is in quite the same aesthetic universe.